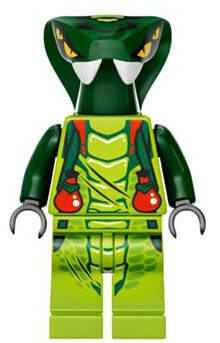 Spitta is a Venomari soldier minifigure released in May 2012. He has a dark green and lime green head, which is identical to Mezmo's except for the colour and eye detail. Like most Venomari, he has four yellow eyes. This is a description taken from LEGO.com. Please do not modify it. Although the Venomari's greatest assets are their teeth, which produce the venom, Spitta has a bit of a problem. Because of his very large teeth, he literally can't keep his mouth shut, so he drools and leaks venom all the time. Leaking venom is not an admirable trait for a Venomari and, besides that, it's just not practical. But Spitta has found a way to take advantage of his condition: he collects and stores the excess venom in vials invented by Acidicus. That way he can sell it to others of his tribe who, at times, may have limited venom production. It's a win-win situation. Spitta appears on the cards "Spitfire Snake" and "Assist". Spitta has the same head mould as Mezmo. Although the Venomari's greatest assets are their teeth, which produce the venom, Spitta has a bit of a problem. Because of his very large teeth, he literally can't keep his mouth shut, so he drools and leaks venom all the time. Leaking venom is not an admirable trait for a Venomari and, besides that, it's just not practical. But Spitta has found a way to take advantage of his condition: he collects and stores the excess venom in vials invented by Acidicus. That way he can sell it to others of his tribe who, at times, may have limited venom production. It's a win-win situation. This page was last edited on 8 March 2019, at 22:38.